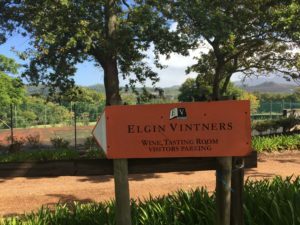 I had wanted to visit Elgin Vintners for a while. 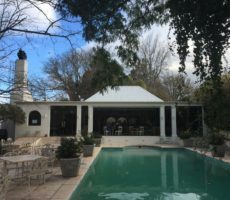 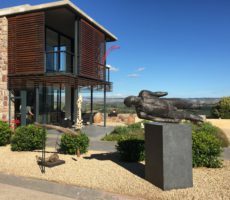 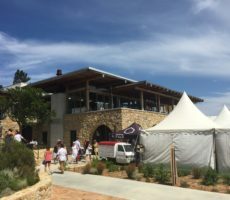 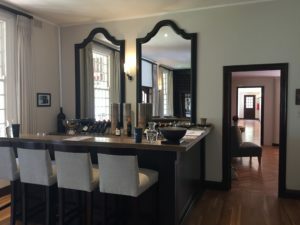 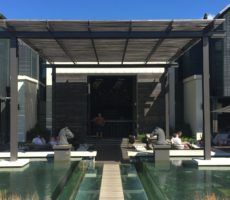 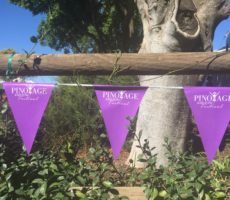 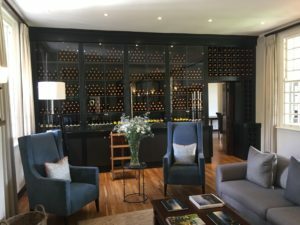 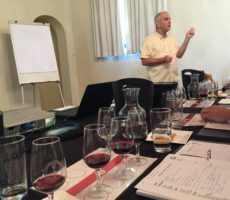 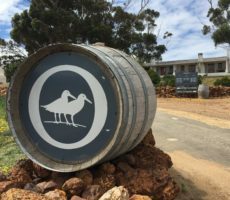 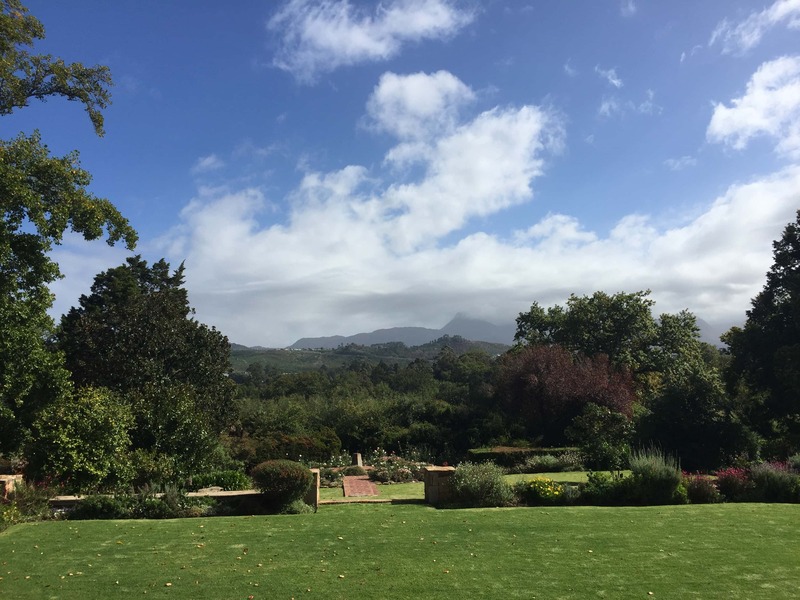 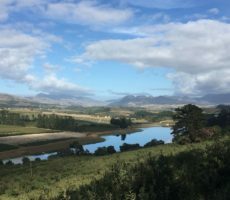 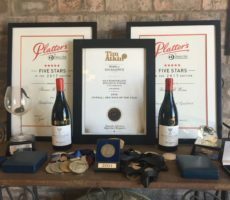 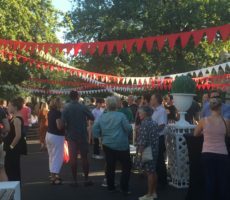 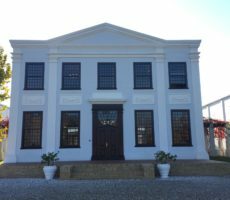 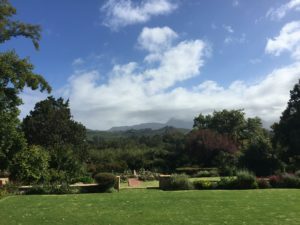 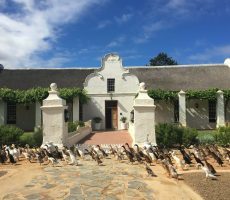 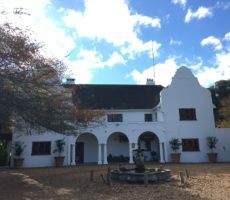 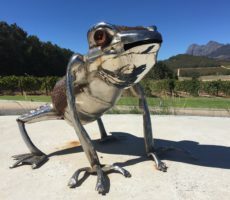 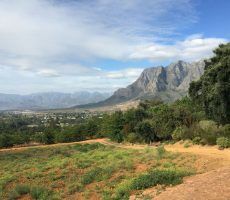 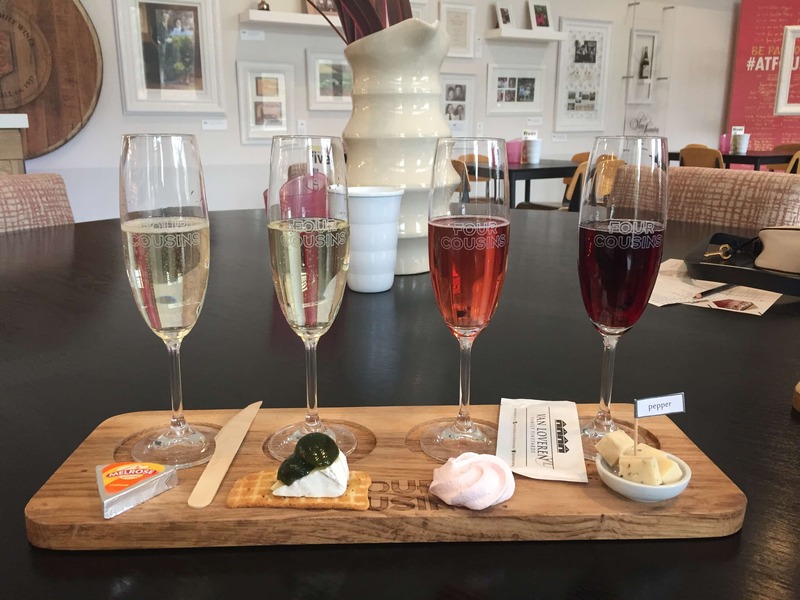 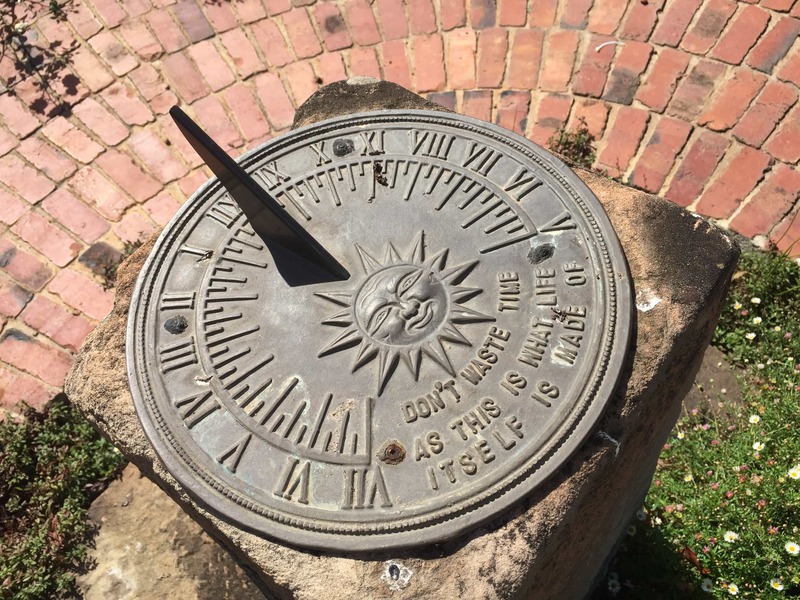 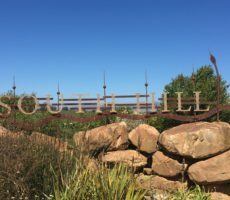 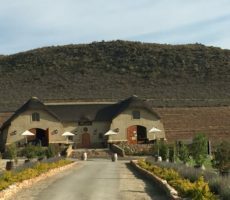 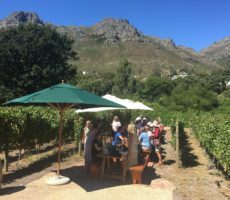 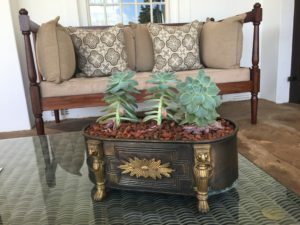 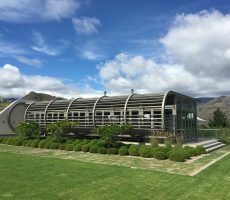 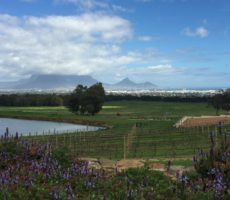 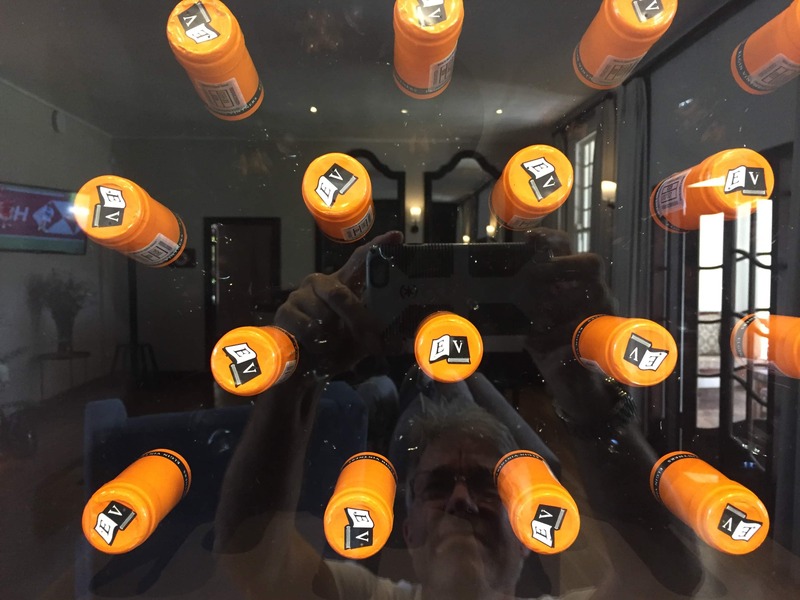 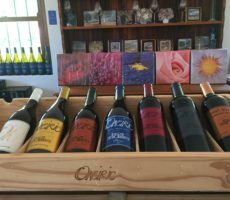 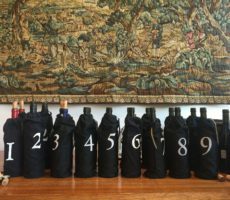 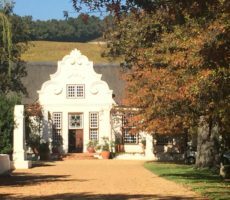 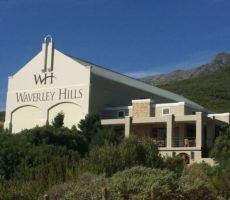 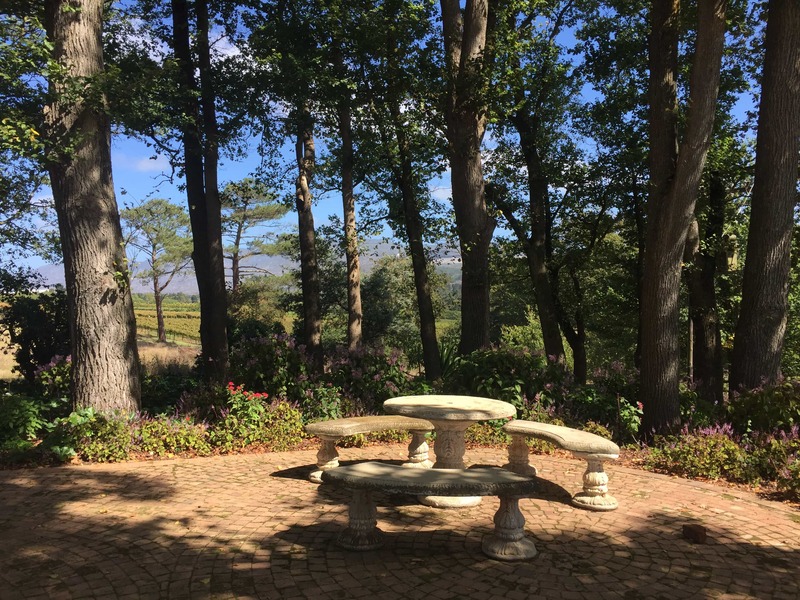 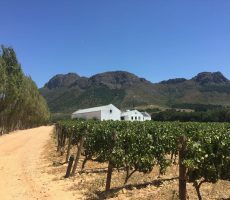 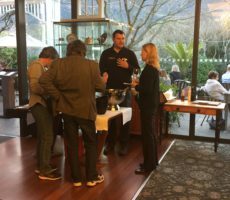 It was in early December when I last visited the Elgin Valley to taste at South Hill Vineyards, Oneiric Wines, Highlands Road Estate, Paul Wallace Wines and Hannay Wines. 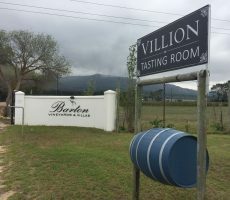 A couple of hours unexpectedly opened up and I sought out Elgin Vintners but couldn’t find the farm. 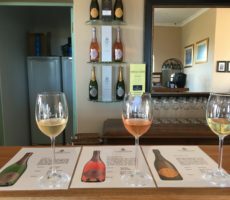 I was better prepared today, for my mini Elgin wine tour, as I made prior arrangements to visit (though open from 10.00 am to 4.00 pm on weekdays for tasting, weekends by appointment). Even so, my trusty satnav took me down a leafy lane off Appletiser Road – the sign said Elgin Country Learning – that was a kilometre ahead of the main entrance. 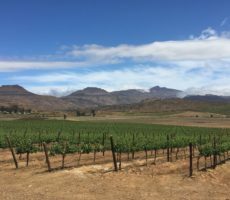 The Elgin Valley is one of my favourite wine growing areas. 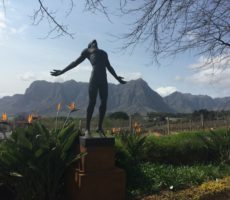 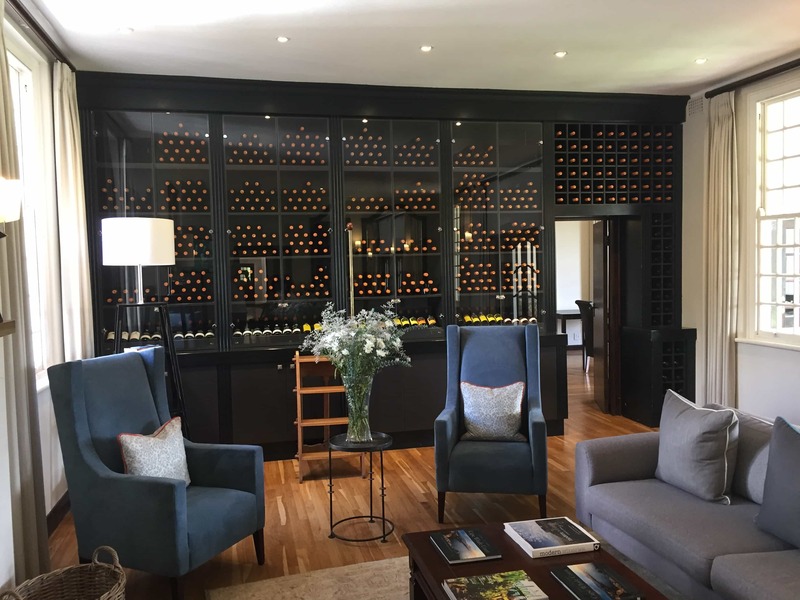 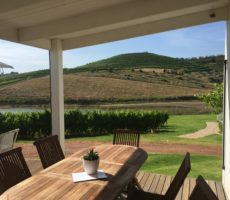 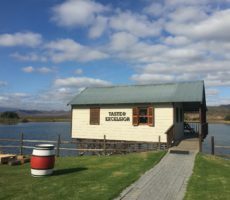 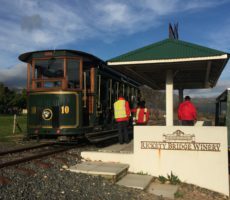 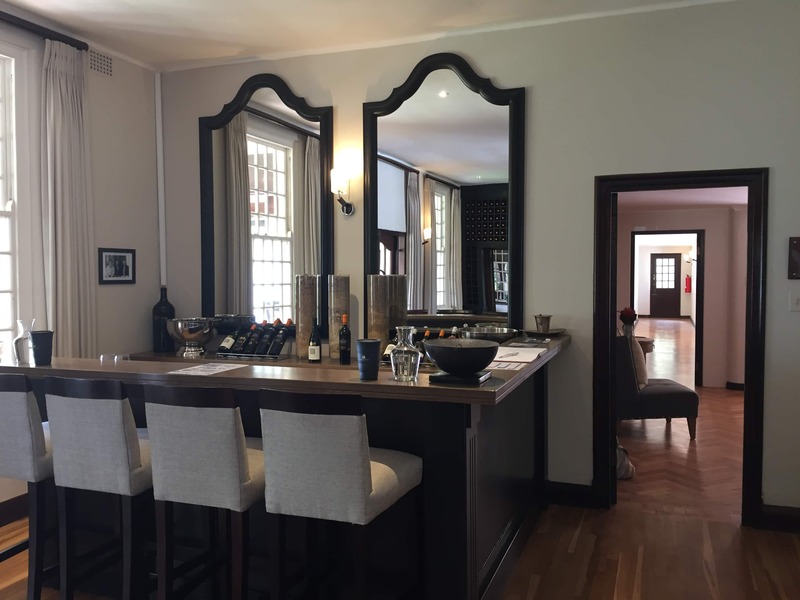 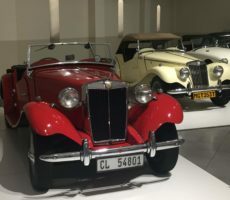 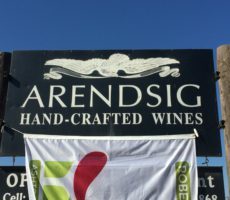 Just an hour from Cape Town, it may not have the tourist cachet of Stellenbosch or Franschhoek but any wine enthusiast will know how special the elegant wines of the Valley are. 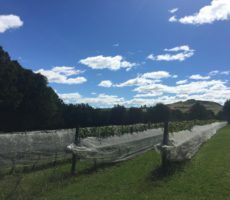 I adore the intimate countryside of rolling hills and their patchwork of orchards and vines that has ebbed and flowed over recent decades as profitability has swung from one to the other and back again. 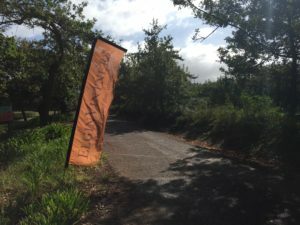 Having made my way down the narrow winding road, Elgin Vintners was well marked by a sign and banner in distinctive brand orange. 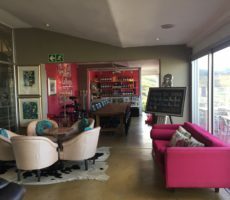 The colouring is from the orange pincushion Proteas that surround the farm. 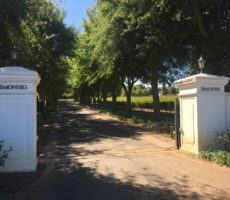 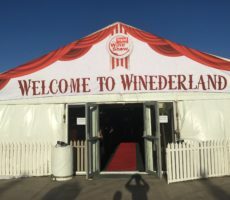 ‘Vintner’ is an uncommon name for a wine estate. 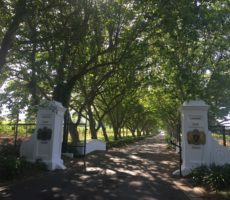 I can think of no other as I write (though I am sure it is not unique in South Africa). 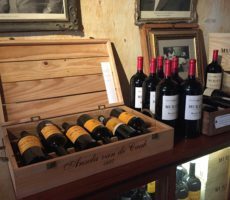 The term means ‘wine merchant’. 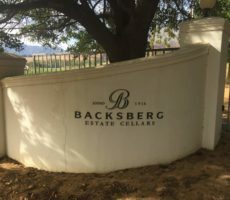 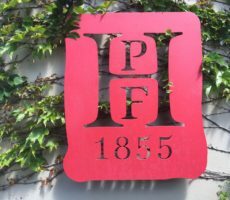 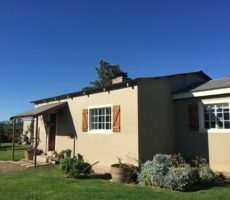 The name reflects the cooperative origins and history of the farm that is made up of a partnership of 6 family winegrowers, unusually aided by 6 winemakers. 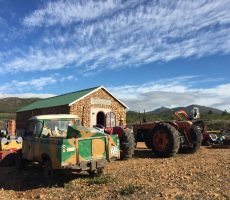 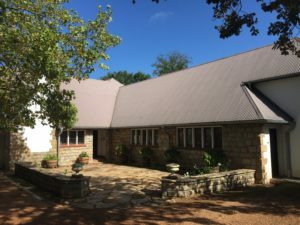 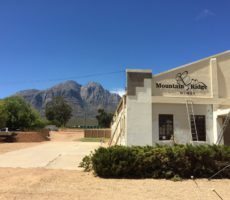 There’s an extended family community too with over 50 homes for farm workers, with a school for their children and an old age home for long-serving employees. 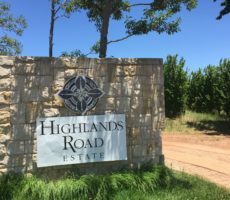 Some 80 hectares of the 800 hectare property are under vine. 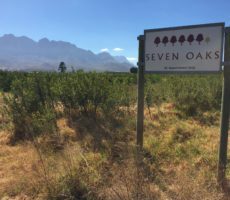 All the big name red and white cultivars are grown in this cool climate farm, including some less frequently planted ones such as Sémillon, Riesling, Viognier and Malbec. 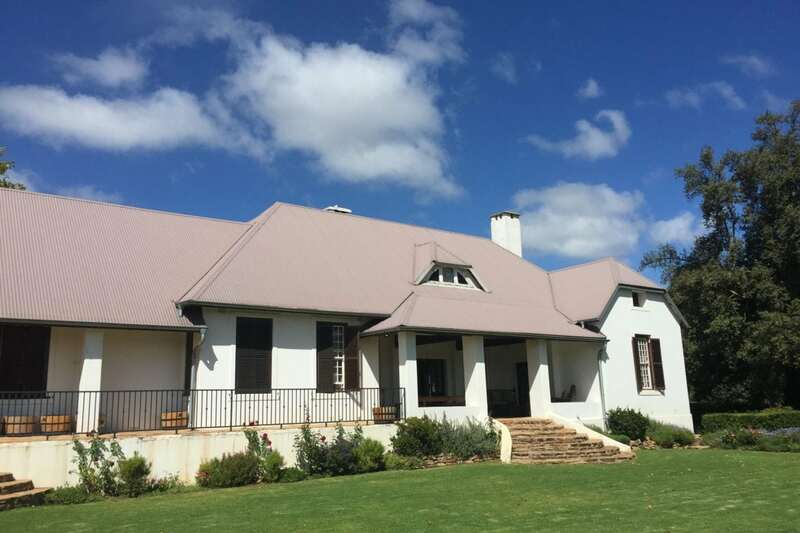 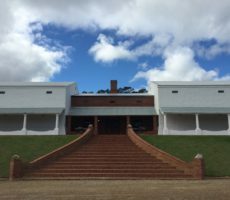 The Tasting Room is in the magnificent old (1927) Ridgelands homestead that has recently been opened for tasting. 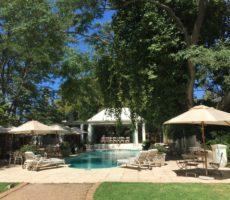 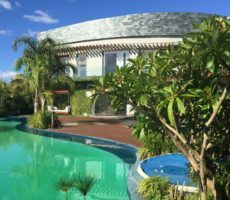 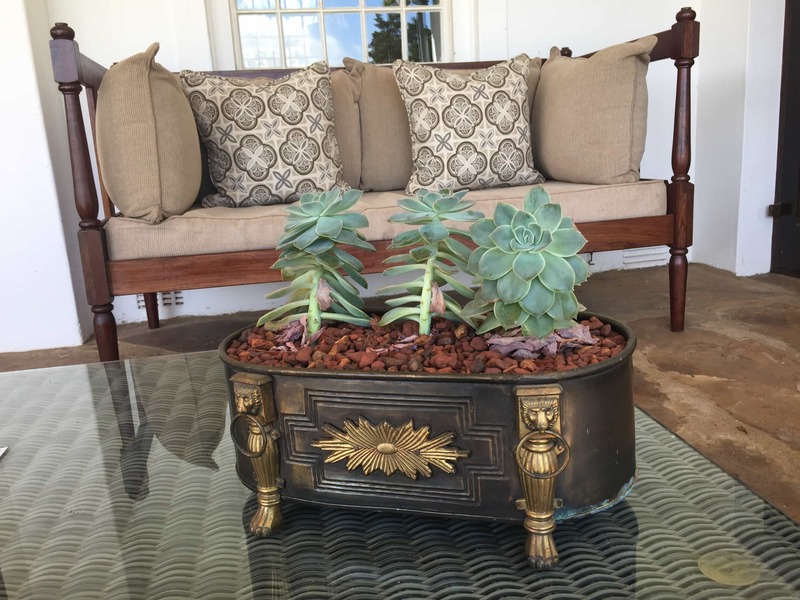 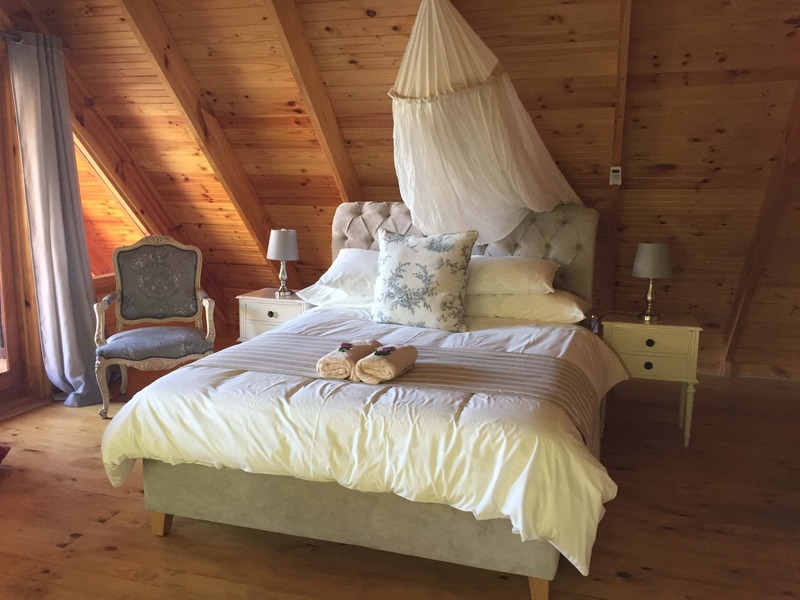 The elegant Sir Herbert Baker designed building, overlooking magnificent landscaped gardens and swimming pool, doubles as a luxury hotel with 5 bedrooms for guests. 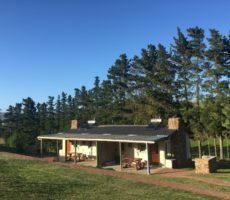 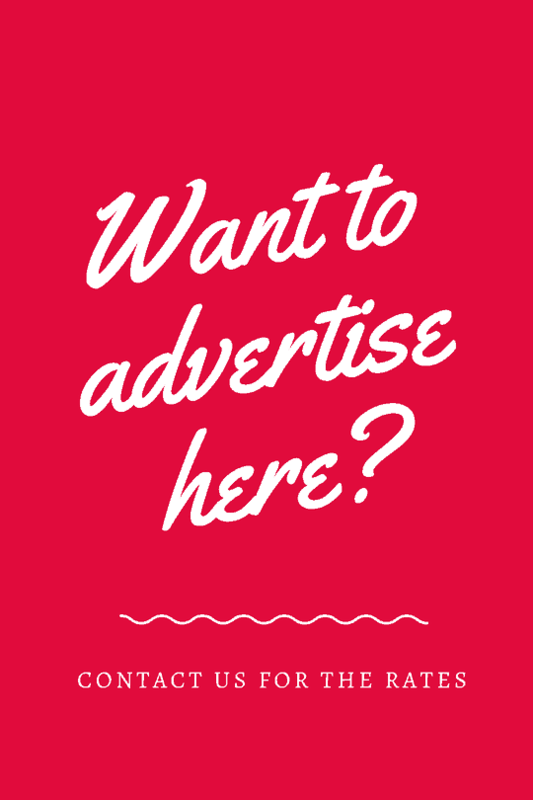 There’s tennis, mountain biking, trail running and a farm walk too for the active visitors. 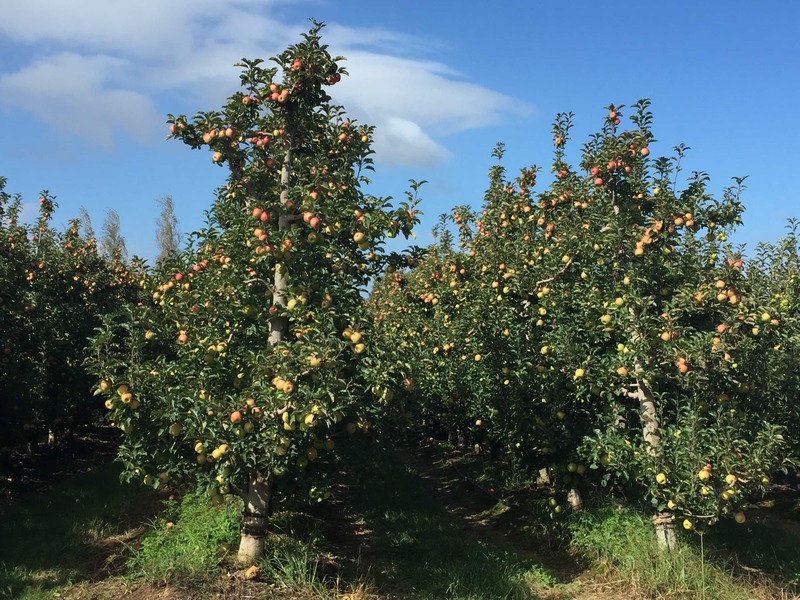 The building and surrounding, manicured orchard landscape reminds me very much of my childhood in Southern England. 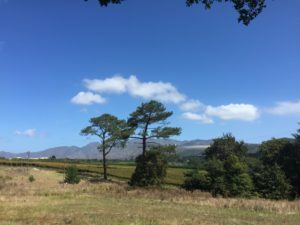 I was brought up in the apple, pear and plum growing counties of Sussex and Kent and so have always felt at home in the Elgin Valley. 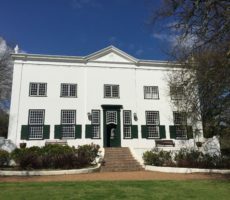 Coincidentally, my family home also was used as a hospital for soldiers injured during the Second World War. 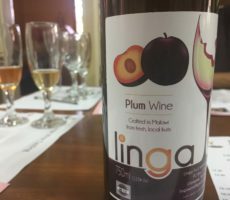 My tasting host was the cheerful Leezan, an accountant by profession and who had returned just a month ago from Zanzibar. 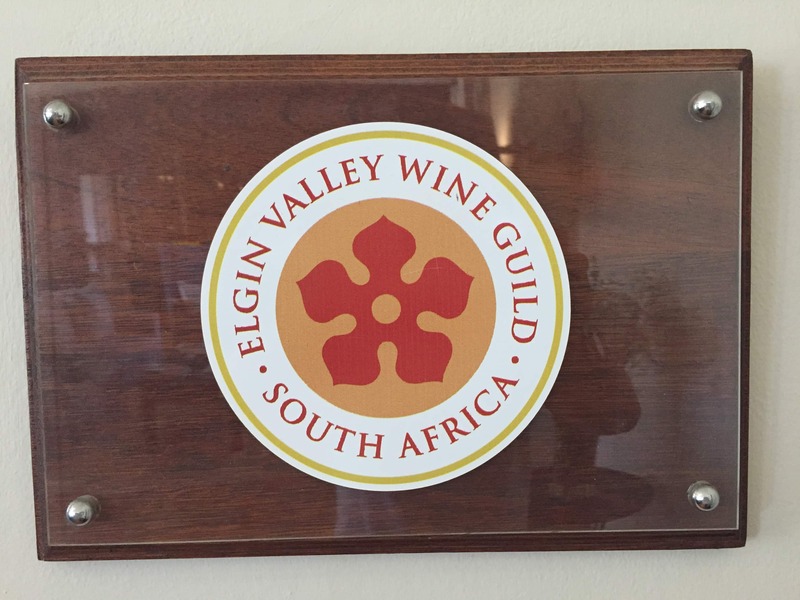 The first wine of the tasting was the Sauvignon Blanc in elegant new ‘EV’ bookplate logo. 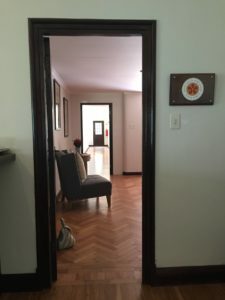 This has largely replaced the previous ‘open book’ label design. 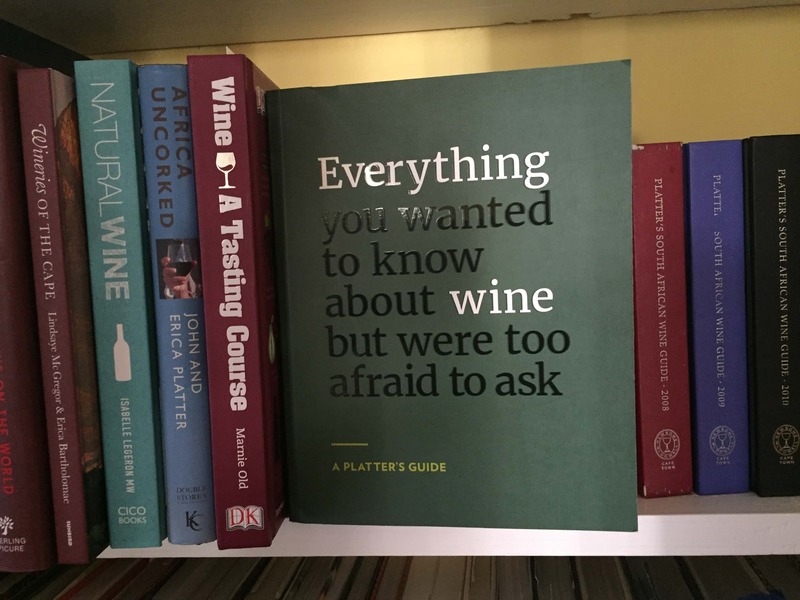 The book theme remains though. Elgin Vintners pride themselves on being ‘Publishers of Fine Wine’ with each vintage being a new ‘Edition’. The shiny pale wine, made from grapes sourced from 3 vineyards that differ in terroir, was classic cool climate Elgin Sauvignon Blanc. 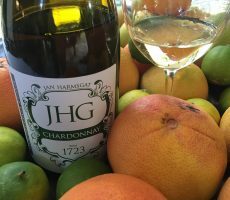 Delicate notes of kiwi, green fig and grapefruit showed underlying aromas of warmer pineapple and citrus to give good complexity on the nose. 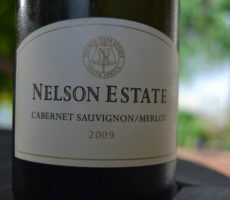 The acidity was bright to give a clean mouthfeel and a decent length. 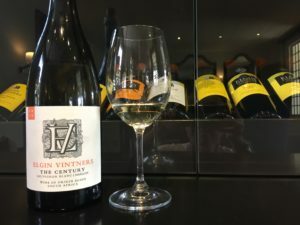 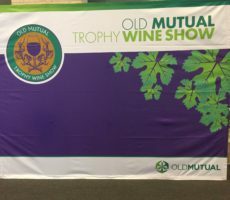 Sauvignon Blanc was blended with Sémillon for the next wine, The Century, named in honour of former owner Douglas Moodle who turned 100 years in September 2011 when the maiden vintage was released. 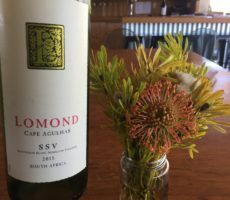 Sweeter Sémillon added warmer honeyed, citrus flavours together with depth to the wine. 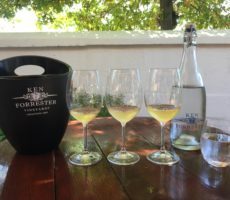 The Bordeaux white blend was also smoother and with less acidity than the single variety Sauvignon Blanc. 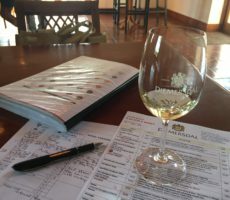 Next for tasting was a lightly wooded (9 months in 40% new French oak/60% 3rd/4th/5th fill) pale yellow Chardonnay. 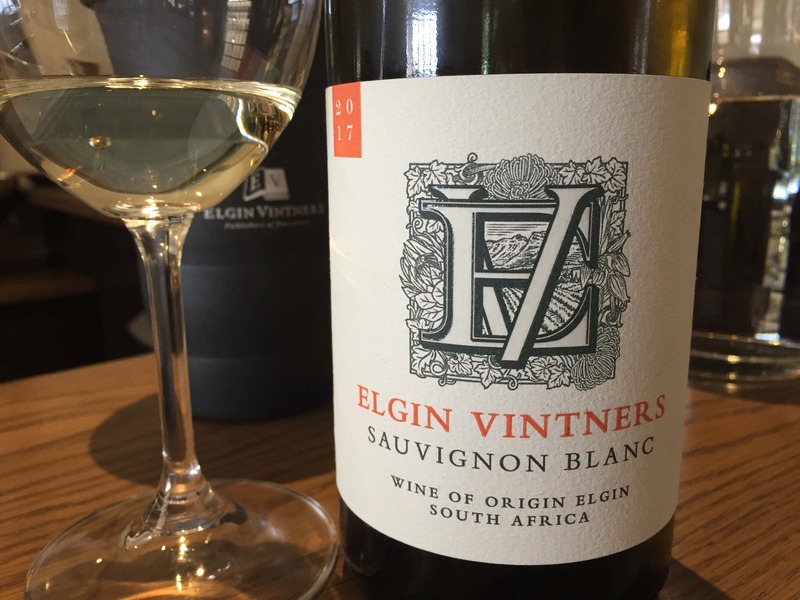 Aromatic wooded notes of vanilla and caramel were to the fore with subtle green apple aromas beneath. This wine was smoother still, well rounded and balanced, with apple flavours emerging on the palate. 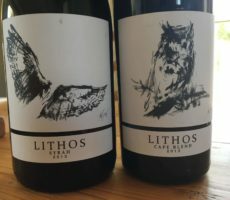 This was a great wine. 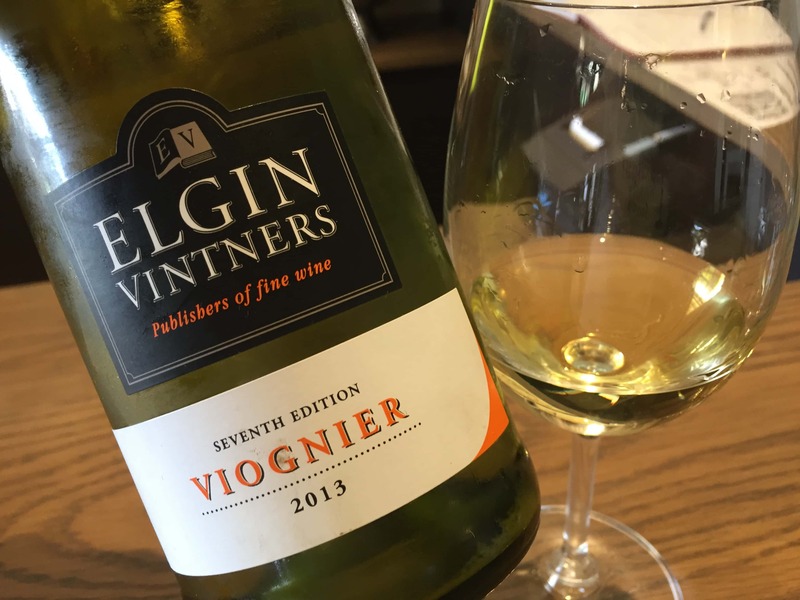 Viognier is used as a minority cultivar in Rhone blends to give complexity and floral notes. 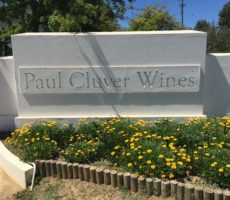 It is less commonly made as a single cultivar wine. General Manager Richard Rose calls the Viognier ‘a red wine disguised as a white wine’. It was less pronounced than many a Viognier. 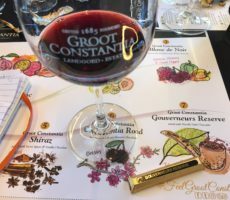 The aromatic character nonetheless showed with a bouquet of jasmine, honeysuckle, sweet lemon and vanilla. 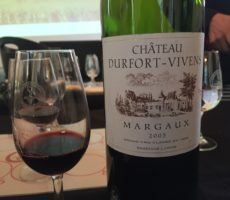 The acidity was moderate and the mouthfeel less ‘oily’ than some I have tasted. 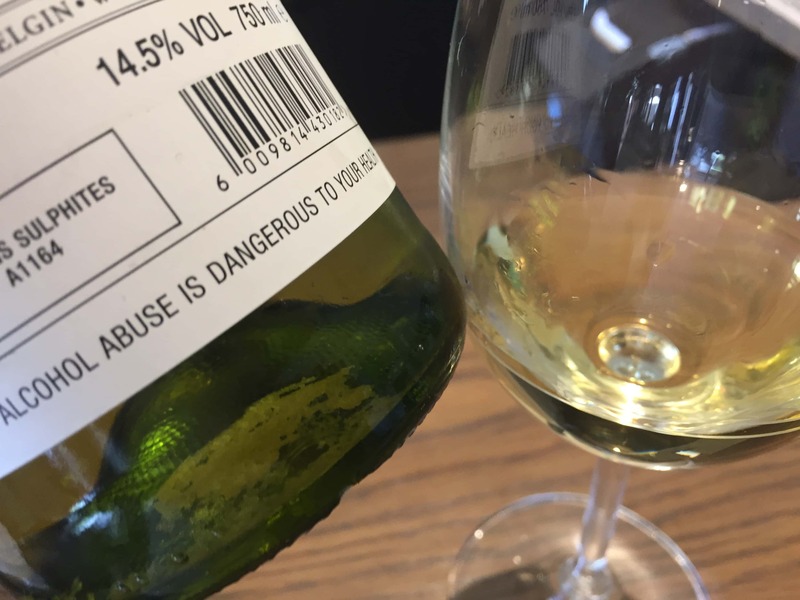 The wine contained tartrate crystals in the bottom of the bottle. 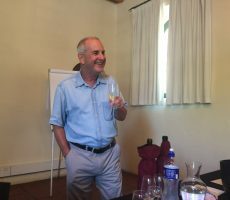 ‘Wine diamonds’, Leezan called them, a rather cool phrase that I had not heard before. 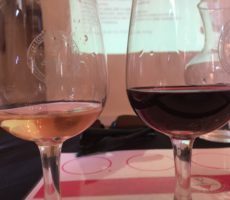 Tartrate crystals are harmless crystalline deposits that separate from wine during fermentation and ageing. 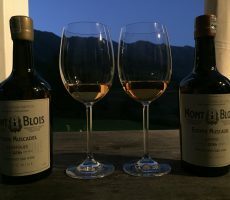 They are characteristic of wines made in cool regions – German wines typically may contain tartrates – and generally removed during cold stabilisation (keeping the wine at – 4°C for a week or so) before bottling. 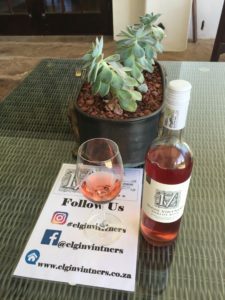 The Merlot Rosé was excellent and great value for its quality. 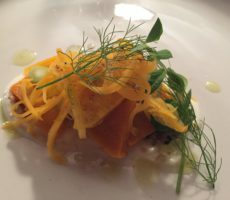 It was an attractive medium salmon colour and showed elegant flavours of wild strawberry and red cherry. 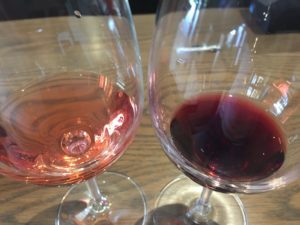 These were well defined (too many Rosés are relatively bland in intensity) to give some weight to the palate. 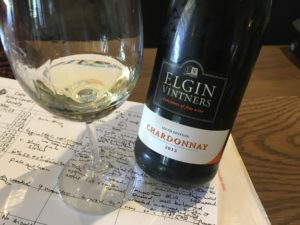 The dry, crisp, clean mouthfeel was perfect for a summer wine. 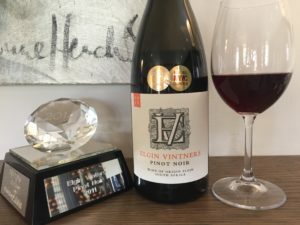 I was looking forwards to tasting the Pinot Noir, one of my favourite wines and where better to taste than in the Elgin Valley. 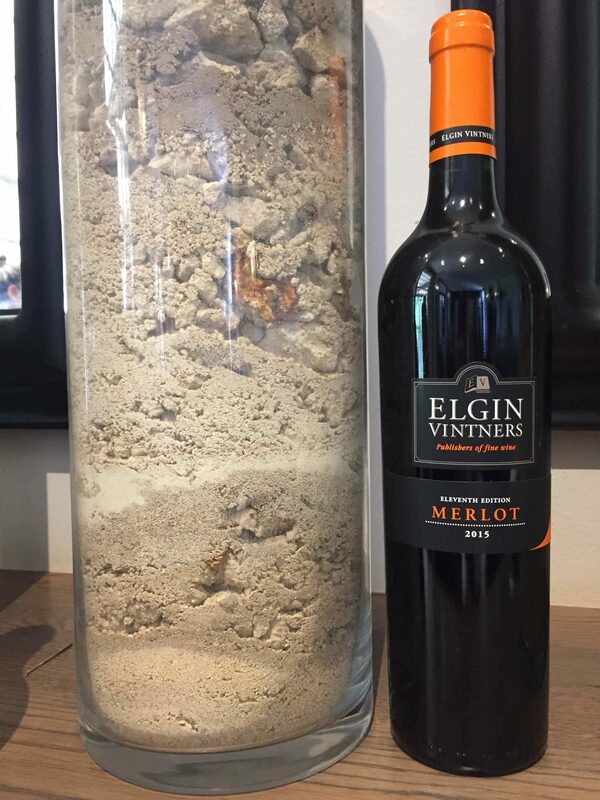 Known as the ‘heartbreak grape’ due to its fragile, thin skins and difficulty fully to ripen, the Elgin Vintners vines that were planted in 2002 on different soil types are some of the oldest in the Valley. 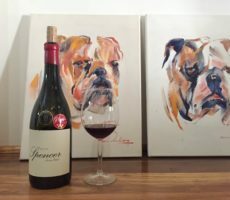 The wine was shy to delicate on the nose with a black peppery bouquet of cranberry, red cherry and redcurrant. 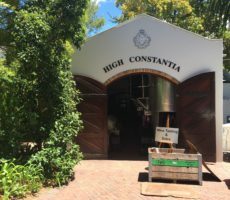 The refined character followed through to the palate which was dry with medium acidity and a full mouthfeel. The length was good too. 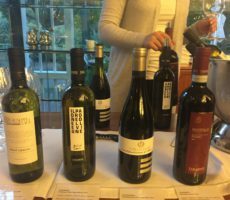 It was my favourite wine of the tasting. 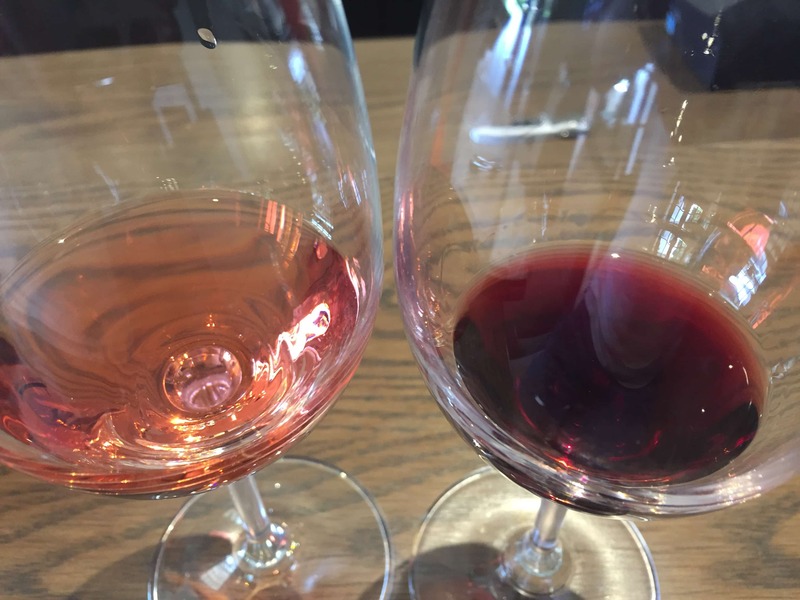 The final wine was a Merlot, the cultivar of the Rosé though with 2 weeks rather than a couple of hours skin contact for a medium ruby colour. It is difficult to find a good Merlot but this passed the tasting test, perhaps aided by a dash (6.5%) of Malbec to give weight and added structure. Full bodied in appearance and with an inviting complexity on the nose – more red than dark fruit of leafy redcurrant, mulberry, cedar, sawdust and tobacco – I liked the lighter style on the palate. 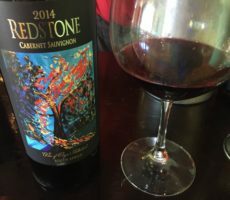 It was better for it as the tannins felt softened, rounded and well balanced. 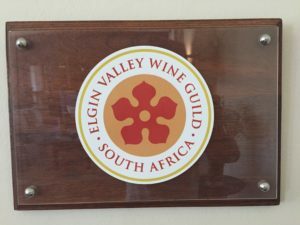 The Elgin Vintner tasting was well worth waiting for and made a great start to my Elgin weekend. 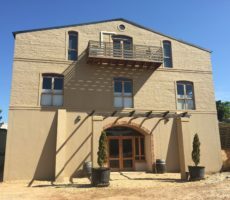 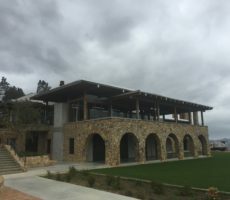 It didn’t matter that Leezan was new to the tasting room environment and referred to excellent notes to describe each wine. 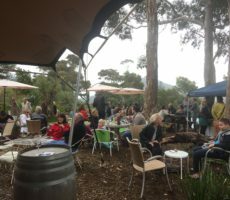 Her obvious enthusiasm shone through. 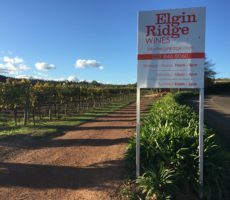 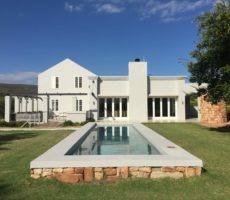 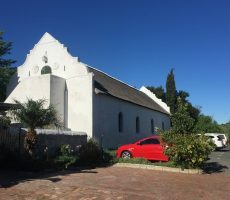 This cooperative estate well showed off the lighter and subtly defined styles of the cool climate wines of the Elgin wine district. 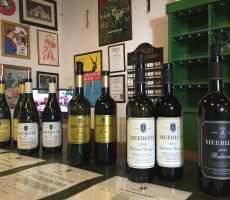 I bought several bottles to taste later and shall enjoy them with fond memories of a great tasting. 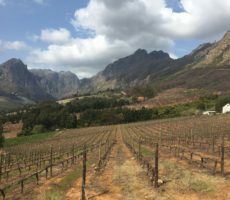 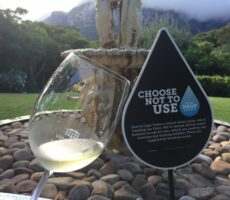 Putting Capelands on the Cape Winelands Map! 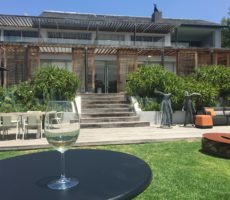 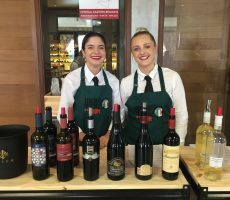 Excellent Unstated Wines and Service – Naturally!